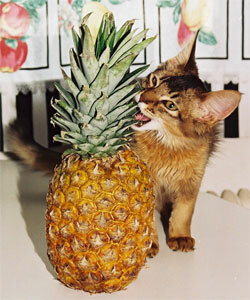 The Somali is an exquisite cat, playful, loving, intelligent and witty. With its expressive almond eyes, soft trilling voice, and charming gestures and caresses it is a highly communicative being. A Somali’s elegant beauty is unsurpassed. It resembles a fox or a lynx with its bushy tail, fluffy ruff, full breeches and tall, tufted ears. 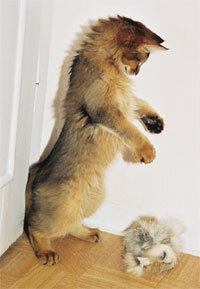 The silky medium-long coat requires little or no brushing. Somalis, like their short-haired Abyssinian cousins, thrive on companionship and attention. They follow their humans around and assist in every activity, from cooking to reading the paper (sitting on the selected page), from vacuuming (attacking the roaring dragon with leaps and growls) to watching TV (chirping and batting at birds flying across the screen). Athletic and inquisitive, they leap and climb like champions and delight in a tall scratching post or a toy mouse tossed into the air. Somalis and Abyssinians are incurable flirts and easily become friends and playmates with other cats or with dogs, cuddling, inventing games, and grooming each other. 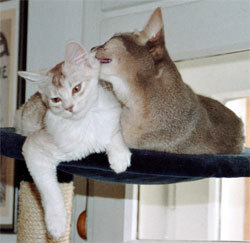 They are more active than true lap cats but are very gentle and affectionate, and they suffer if left alone too much. A second animal would be a valued companion, especially if the human family members are away from home for long hours. The friendship between the animals can only add to the pleasure of living with this fascinating cat. The Somali, like the Abyssinian, is an agouti cat. Each hair has several bands of color, alternating between the base color and a deeper shade known as the ticking. This shimmery ticked effect on the head, back and tail is harmonized by a warm, solid base color on the belly, or in the case of silver Somalis or Abyssinians by pure, silvery white. A darker stripe runs along the spine from the head to the tip of the tail. The original ruddy has a deep apricot-brown base coat ticked with black. Sorrel or red is a glowing coppery red ticked with chocolate-brown. Blue is a warm peach-beige with shades of slate-blue ticking. Fawn is a soft rose-beige with creamy cappuccino ticking. The brilliant silver variations all exhibit a snowy white undercoat. Black-silver is ticked with black, sorrel-silver with cinnamon-brown, blue-silver with slate-blue, and fawn-silver with coffee-cream.